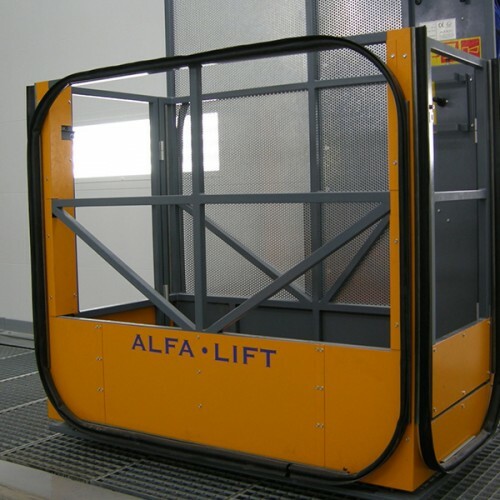 Specifically designed for use in spraybooths and on paint lines, as well as for other surface treatment applications the Alfa-Dis Alfa-Lift platforms facilitate faster, safer and easier means of masking, painting and inspecting commercial vehicles, machinery and equipment. This range of personnel access platforms have advanced design features, making them suitable for painting in spraybooths and other hazardous environments. They provide an improved quality of work and a greater efficiency with a faster safer application of paint, masking or inspection, as well as replacing ladders and scaffolds. 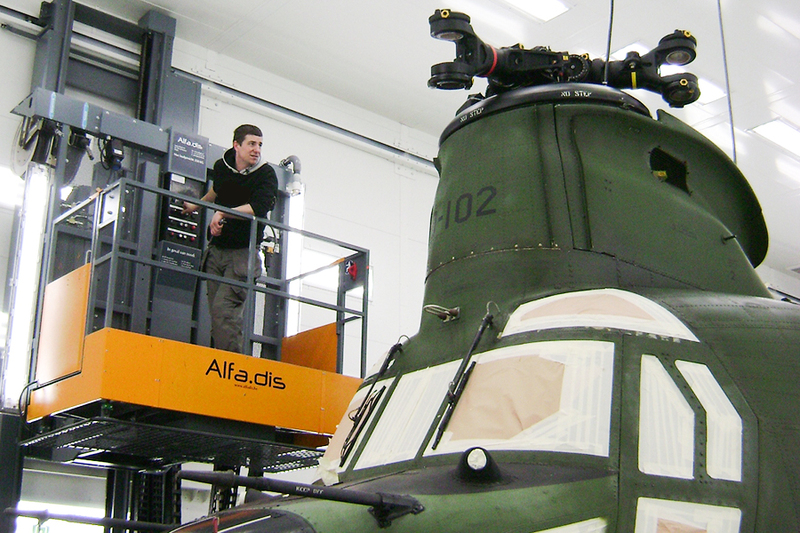 Personnel access platforms are safe and easy to install and can be retrofitted into most types of spraybooth. The controls of the platform are located inside the cage making it easy of the operative to use. 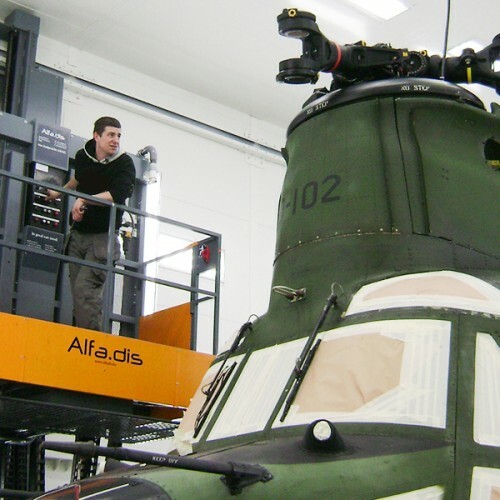 Alfa-Dis platforms boast many safety features making them safe and easy to use. Personnel access platforms offer you the optimal working position, increasing the efficiency of the job as operatives no longer need to use ladders or strain to reach difficult to access areas. 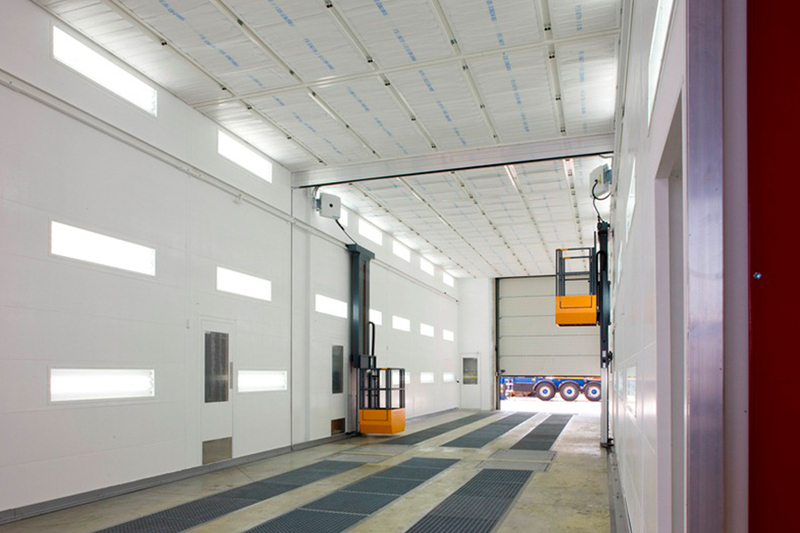 The HX range of platforms are pneumatic in operation and ideal for hazardous environments, such as spraybooths. 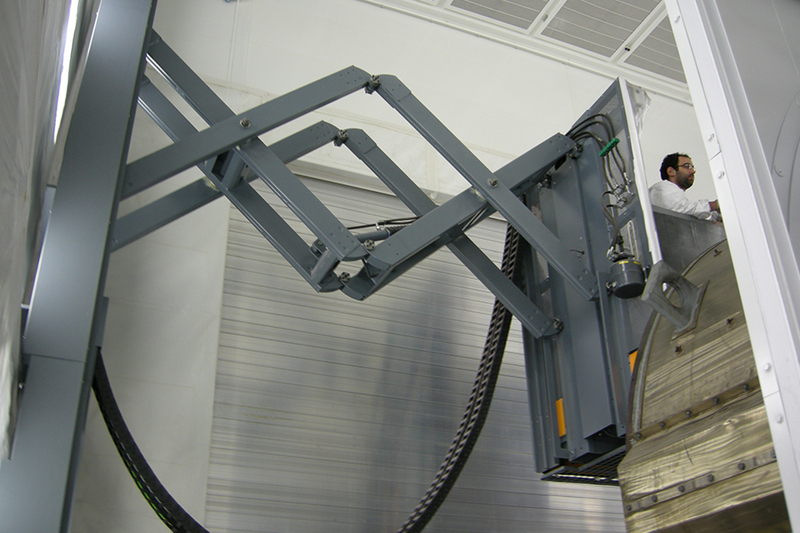 The easy to use controls are located within the cage and comprise of three levers allowing the operator to move in 3 dimensions. In & out, up & down and left to right. Fixed rails allowing the platform to move laterally ensure that the platform does not come into contact with the spraybooth floor. HX3 is a fully pneumatic platform which can carry one person and their equipment. 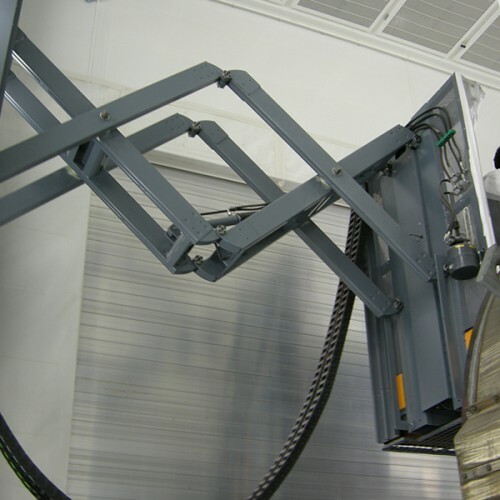 Mounted on the side walls of the spraybooth it increases access for the entire workspace, leaving the floor free from obstacles HX4 is designed to carry two people and their equipment. The platform has automatically closing doors on each side for safety and can be customised according to customer requirements. 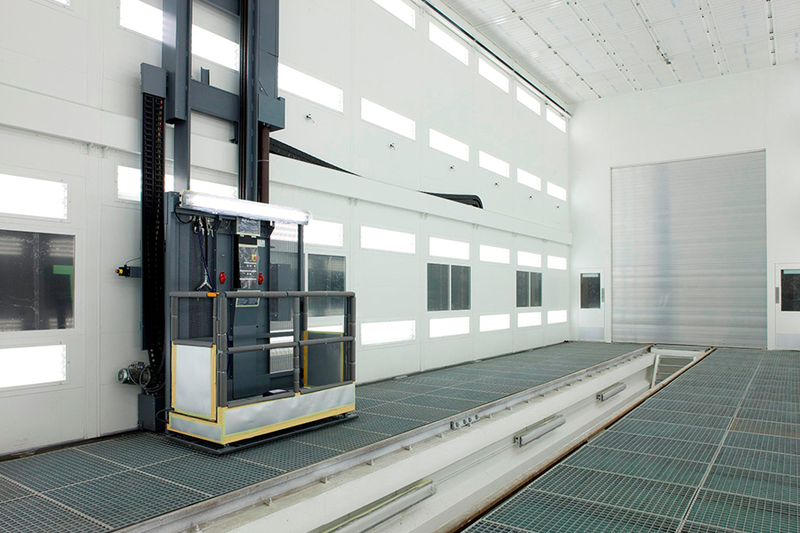 HX5 is purpose built for spraybooths that have structures which aren’t strong enough to support the platforms. 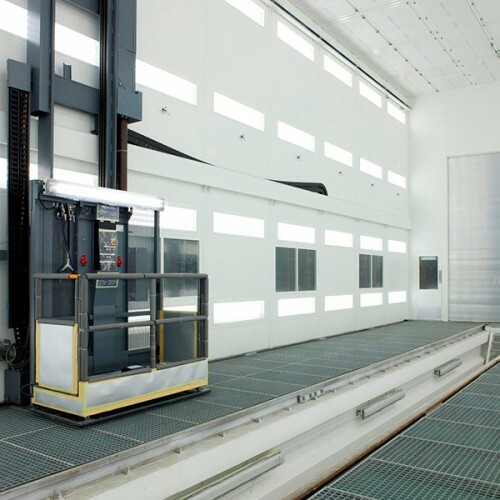 HX5 drives along the spraybooth floor and does not come into contact with the wall of the structure. The Platforms are pneumatically powered by hose reels, cable chains or cable trolleys. 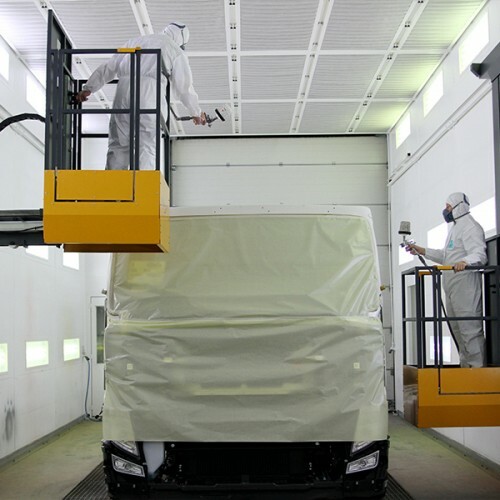 The platform does not consume more space than a standard paint spray gun. The floor is made from non-skid plating and the platform is surrounded by railings and a base board to prevent objects from falling. For more specialised requirements, platforms can be designed and manufactured to customers specifications. The HD and HE range of platform provide a safe working environment for those working at height. With a much higher reach than their pneumatic counterparts, they are ideal when larger items must be within easy reach. Designed for use in spraybooths and other hazardous areas the HDS and HES are scissor lifts able to carry two operators and their equipment. HDR and HER are a swivelling arm mounted lifting platform that moves on rails and is equipped with hydraulic or electrical traction. The controls are situated on the platform for ease of use. The platform moves in three directions, in & out, up & down and left to right. The floor of the platform is gridded and the platform has railings and a baseboard to prevent objects from falling. For more specialised requirements, platforms can be designed and manufactured to meet specific requirements. 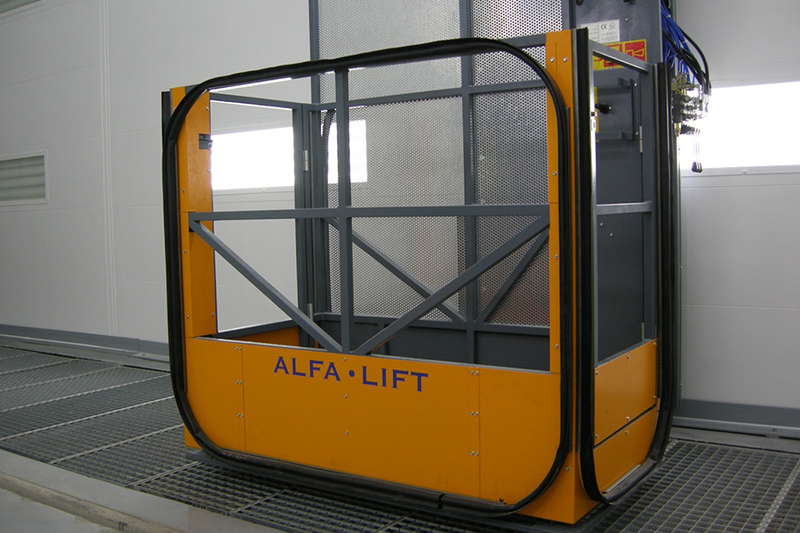 The safety technology is built-in as standard across the Alfa-Dis Alfa-Lift platforms range. It includes features to prevent the accidental opening of access doors, collisions with obstacles and the ground, the leaking and pinching of hoses and excess weight. Hydraulic platforms also include other safety measures, such as two chains fitted as standard, so even if one should fail, the other chain will ensure that work can continue safely. Operator protection also includes safety harnesses which are secured to two anchoring points on the platform. Synonymous with innovation and development, Junair are renowned for quality products that are manufactured to the highest standards. 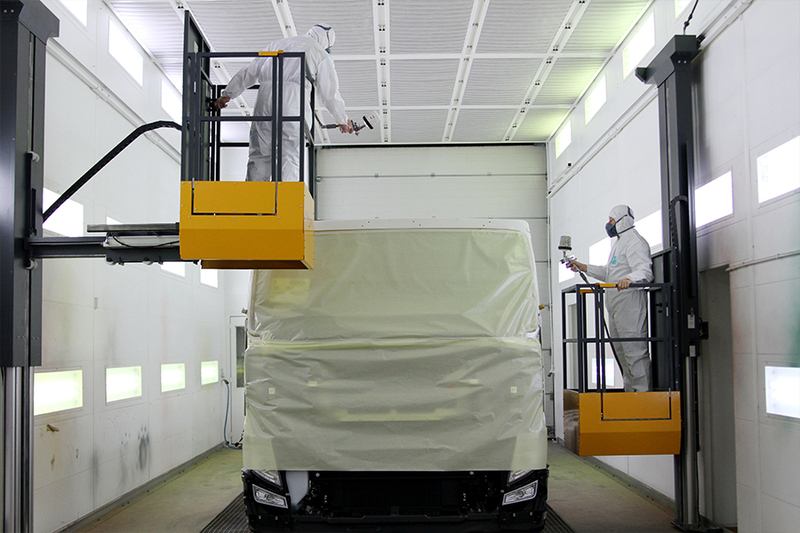 We have pioneered some of the most notable advances in spray booth technology, so our products never fail to impress. 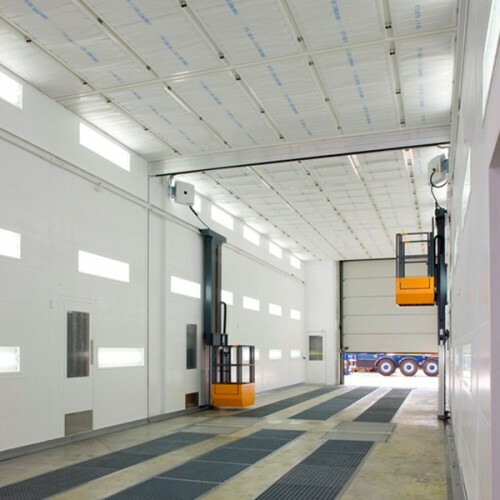 See the full collection of available Junair Spraybooths Commercial Spray Booth Equipment and Services.